To understand why you should use a Competent Person, Download the consumer booklet. This website has been developed by a collaboration of all of the approved scheme providers to provide the consumer with the ability to search for a Competent Person registered with one of the schemes. 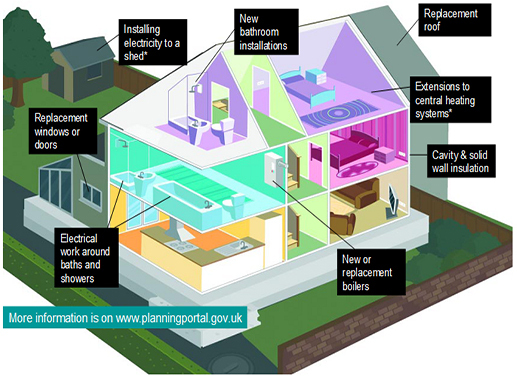 A handy building regulations guide for anyone looking to start building work or major repairs on their home. To make searching easier, you only need enter the first few letters of the business name or location. You must enter at least 2 characters for the search to work. Text can be entered in upper or lower case as the search is not case sensitive. The search works on matching text strings, so if the business you are searching for cannot be found, try entering only a single word or the first few letters in the business name. Avoid using terms such as Ltd or Limited, as abbreviations may not be consistent with those used in our database. If the search returns a large number of businesses try narrowing your search by entering other options such as location or scope. Copyright Competent Persons Register 2015. All rights reserved.